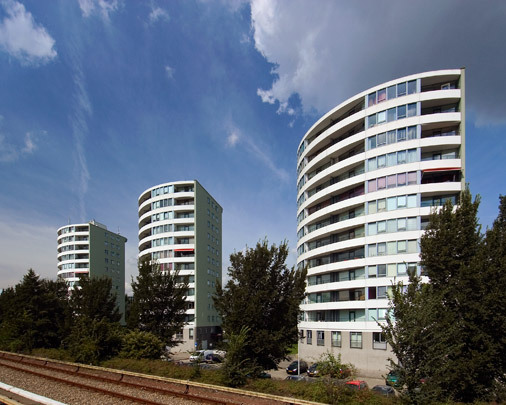 This residential estate encompasses a triangular plaza on which stands a block of shops and housing adjoining a metro station, a triangular low-rise portion of seven residential rows set square to rural 's-Gravenweg and three fan-shaped residential tower blocks along the metro track. The base of the housing rows is in grey concrete, with bright colours or white rendering above. The quadrant shape of the tower blocks contrasts the openness and resolutely horizontal articulation of the south-facing curved facade with the unmodulated straight sides.